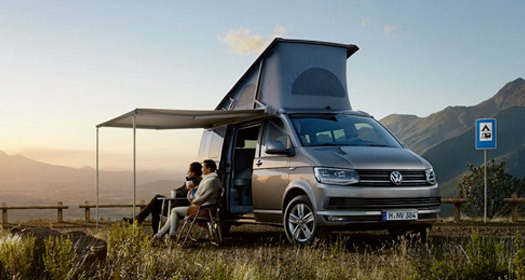 Take possession of your campervan and build your own itinerary. An ideal formula for free-spirited adventurers or anyone prone to spontaneity. Create precious moments as you tour one of the most beautiful regions of France in your luxury campervan. Holidays should be your time out. So why not rent a campervan and let us organise your itinerary? With over 15 years of experience in organising holidays on Corsica, we provide a high quality, professional and personal service. 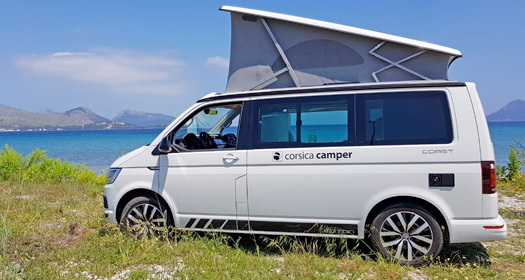 As well as equipping you with a campervan, we will reserve your 4 and 5 star campsites, and provide you with a detailed roadbook, giving you suggested routes and useful information to help you get the most out of your campervan holiday on Corsica. Ideal for VIP trips, delegations, sports clubs, incentives, shooting, etc. The new generation campers, bought new. High-end materials, assembled by the manufacturer. Telephone assistance 7 days a week. Based on the island of Corsica, you have access to the knowledge of our travel agency, specialised in tailor-made tours. It is possible to find cheap car or campervan rental on Corsica. Remember to check that the renter is registered as a company and that he has the necessary insurance for the rental business; to do this, first look at whether the website has a SIRET number and if the sales conditions include company and insurance information. A mobile phone number (instead of an office number) as a means of telephone contact should also arouse your attention. Be careful not to rent a vehicle registered outside of France, except possibly if the vehicle has French insurance. If the vehicle you hire in France, does not have French insurance, the insurance will be null and void in an accident (just when you need it). Corsica Camper complies with all of the regulations in force, which means you will be protected in the times when you need it most.